Looking for a way to make a difference? Volunteer to help others! Come join the Encompass Hospice Volunteer TEAM! 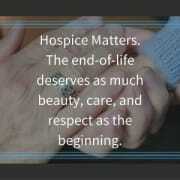 Be a part of our special team of Encompass Hospice Volunteers. We care for our patients in the place they call home -- a private residence, skilled nursing facility, assisted living facility, or other inpatient settings. Just a few hours a week can make a lasting on the lives of others. Direct Patient Care - Sitting with patients, reading, working puzzles, watching tv/movies and life review. This may also include Caregiver Respite where you will visit with the patient while the caregiver runs errands, takes time for themselves or goes to appointments. Office - Assistance in the office that could include: filing, assembling notebooks, copying and data entry. Bereavement - Assisting our Bereavement/Volunteer Coordinator with mailings and administrative duties. Computer skills preferred. Training provided.